Photo: Dan Kitwood/ Getty Images. West Yorkshire Police said on Thursday they had arrested a man in connection with Cox’s death. 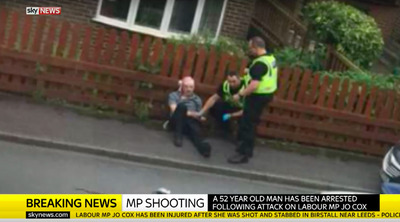 Cox, a member of UK parliament from the Labour Party, was shot by a male attacker three times and stabbed at around 1 p.m. local time, police said. She died shortly afterwards of her injuries. The assailant involved in the attack reportedly shouted, “Britain first,” during the assault, although it was not clear whether the chant was related to the far-right political party by the same name. The man arrested in connection with the attack has been named by residents and multiple news reports as Thomas (“Tommy”) Mair, aged 52 years old. Police have not released a name. Mair’s brother, Scott, told reporters he cried when he heard the news and was “so sorry” for Cox and her family. “I am struggling to believe what has happened. My brother is not violent and is not all that political. I don’t even know who he votes for. He has a history of mental illness, but he has had help,” he said, The Daily Telegraph reported. Sky NewsA man is arrested by police following the attack on MP Jo Cox in Birstall, West Yorkshire, June 16, 2016. The Guardian reported that Thomas Mair had told The Huddersfield Daily Examiner in 2010 that he had volunteered at the nearby Oakwell Hall country park following his attendance at the Pathways Day Centre, which treats adults with mental illness. “I can honestly say it has done me more good than all the psychotherapy and medication in the world. Many people who suffer from mental illness are socially isolated and disconnected from society, feelings of worthlessness are also common, mainly caused by long-term unemployment. “All these problems are alleviated by doing voluntary work. Getting out of the house and meeting new people is a good thing, but more important in my view is doing physically demanding and useful labour. Mair reportedly lived in the terraced house on his own. He had lived with his grandmother until she died two decades ago, The Financial Times reported. He has never been employed full-time, according to The Daily Telegraph. A cross-party vigil was held in memory of Cox in Parliament Square, Westminster, on Thursday evening. Another vigil was also held on the boat in London where Cox lived with her husband and two young children. “Jo believed in a better world and she fought for it every day of her life with an energy, and a zest for life that would exhaust most people. “She would have wanted two things above all else to happen now, one that our precious children are bathed in love and two, that we all unite to fight against the hatred that killed her. Hate doesn’t have a creed, race or religion, it is poisonous. Cox won her seat in parliament in the 2015 general election. A former aid worker, Cox set up and chaired the all-party Parliamentary Friends of Syria group and was the national chair of the Labour Women’s Network. She was also part of the Stronger In campaign, advocating that Britain vote to stay in the European Union in the June 23 referendum.